We manufacture, and export a selection of fashionable necklaces. Designed with different colours and shapes & sizes, fashionable necklaces are available in plethora of colors, patterns and designs. Ideal to wear with casual outfit, these fashion necklaces captivates one's senses easily. 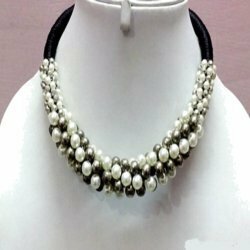 Available at the most competitive prices, our variety of fashion necklaces can be customized as per the specifications of the bulk buyers. Established in 1995, Aesthete International Limited (AIPL) took over the business of a sole proprietorship export firm, which was actively involved in exports since 1992. The company exports to several countries, with its major market being Latin America. Our extensive partner base of manufacturers in the Asia Pacific region ensures our expertise in the procurement of a range of cost efficient product mix. We provide customized service solutions and a comprehensive product range to our clients, globally. Our list of products encompasses, but is not restricted to costume jewelry, umbrellas and Christmas lights.